You have all weekend to make this dinner for Valentine’s Day, but lucky you, you only need about thirty minutes. It’s a long story, but a few years ago this was our super bowl dinner, as we were having our floor repaired. They were supposed to finish on Saturday, but it was a tough job as it was one of the coldest days of the year, and it was pouring. I’m not complaining; they worked hard, but it prevented us from inviting anyone over to watch the game, and the kitchen was cold. I did care, however, about dinner. In a very cold kitchen, amidst the clamor of hammers and other noisy tools, I managed to make two kinds of grain free chocolate chip cookies and an amazingly great rack of lamb dinner that took almost no effort. The workers left, and dinner was ready. The floor was no longer a safety hazard. Peace and quiet were restored. 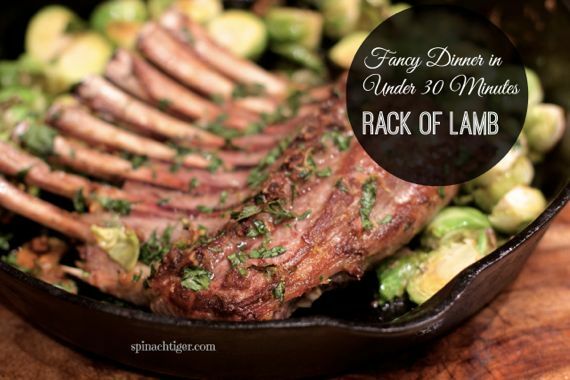 A juicy rack of lamb sings of romance and calm. Total prep time was less than 10 minutes, roasting time at about 20 minutes. It hit all the right spots. Healthy, grain free, hearty, decadent, tender juicy rack of lamb that was so good, we think this was the best lamb dish we ever ate at home. You could make this together for Valentine’s Day weekend, with minimal effort. It will bring a smile to both of you and you won’t feel overly stuffed. 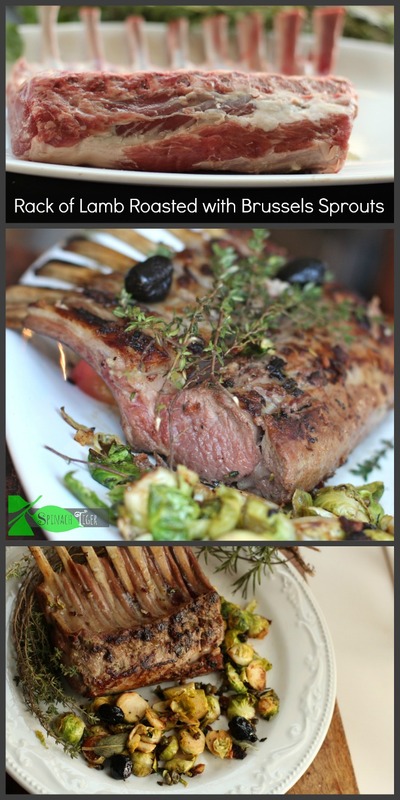 The Brussels sprouts were a surprisingly perfect accompaniment to the medium rare, juicy, tasty roasted rack of lamb. I served no sauce, no condiment, as the lamb chops were so juicy and flavorful, they are meant to be enjoyed naked. So tell me do you go out to a restaurant on Valentine’s Day or do you prefer to stay in. I’d love to see you comment! Please connect with me on instagram and subscribe and never miss a delicious healthy recipe. 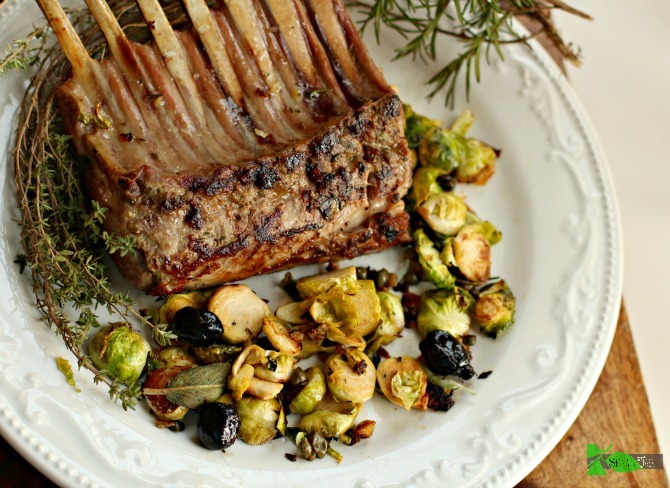 Roasted rack of lamb with Brussels spouts, juicy and tender, made in under 30 minutes. Prepare a marinade of 2 tablespoons olive oil, Dijon mustard, and minced garlic, capers. Look here for an easy way to peel garlic. French the rack of lamb, cutting all the fat between the bones (your butcher can do that). Cut off most of fat across the rack. Lamb can often have too thick of a fat layer. It will still be juicy. Trust me on this. Smear the marinade all over the lamb. Cover and marinade for 4-6 hours. Take out of refrigerator 30 minutes before cooking. When you do that, preheat oven to 450 and prepare Brussels sprouts. Wash and trim Brussels sprouts and Slice them in half. Toss them in olive oil and season with salt and pepper. Add olives if you like. Heat cast iron pan in oven for about ten minutes. Place rack of lamb in oven for 10 minutes. Continue to roast both for ten minutes. Check temperature of lamb. An internal temperature of • 130-140 °F (54-60 °C) will give you medium rare. If Brussels sprouts don't seem done enough, remove lamb to a serving dish, cover with foil, allow to rest, and cook Brussels sprouts a few more minutes. Season lamb chops with salt and pepper and chopped Italian parsley. Normally, I add freshly chopped thyme and rosemary to my lamb chops. I didn't have any and I used parsley. Feel free to add thyme and rosemary. This looks amazing! You are such a great photographer besides your excellent cooking skills. I am pinning this right now! Hi Scarlet. Thank you. This really was that easy and good. Enjoy. Lamb is just one of my favorite meats although I rarely buy it. I did notice that Trader Joe’s has frenched lamb chops ready to go as well as a marinated lamb roast…so perhaps I will grab one of these next time I am in there and give your lovely recipe a go. I hope you are well and managing to stay warm.